There are so many freebies and give-aways at Comic Con, you'd need a supermarket trolley to carry them all in - even if you left your wallet in the hotel room. 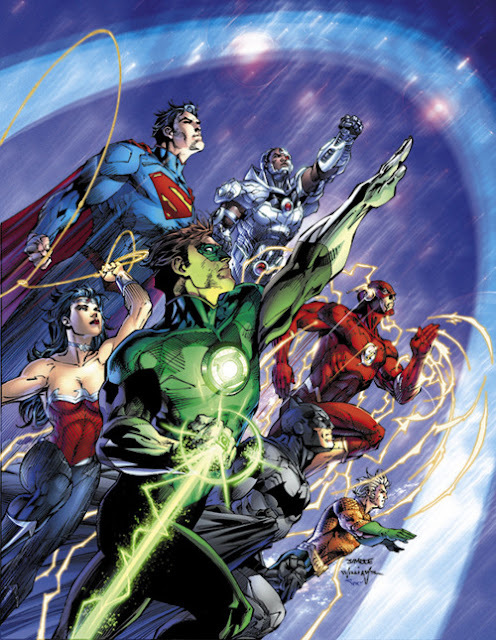 Luckily for those of us not able to attend this year, colourist Alex Sinclair has posted the cover of the SDCC 2011 Souvenir Book that he created with the rest of the artistic trinity - penciller Jim Lee, and inker Scott Williams. Ummm you're drooling. Finally the big guns are back in the JLA, Cyborg's stepped up and one of the top creative teams in the business are assigned to their new series kicking off this August. Life is definitely good (tho next year Cyborg and Aquaman will be in front). For more of Alex's work, click the jump.